Library re-organization simplifies searches for plants, materials and objects. Use view library and preview before choosing a category in the library navigation window. Navigation and search functions are streamlined with the updated properties/content bar. Edit toolbar A rearranged tool bar with dimension tools enhances editing. Indicate your interface color preferences through the Edit Menu. This huge selection of 3D objects add realistic dimension and detail to your project. Add your own personalized touch to every room. Discover a treasure drove of furniture pieces, fixtures and accessories. Download and import new objects into your library dynamically. Update your library with new objects to put the finishing touches on your project. 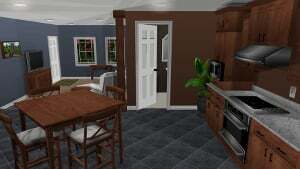 Having trouble deciding on a style for your dream home? New TurboFloorPlan Home & Landscape 2016 offers a new selection of sample plans including Caribbean Modern, Chateau, Colonial, Contemporary, Country Farmhouse, French Country, European Cottage, Tudor, Tuscan, Modern and more! 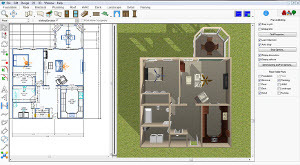 TurboFloorPlan Home & Landscape 2016 now offers an extended wall heater style library in the HVAC planner. Get the answers you’re looking for faster than ever.